Hello Friends, What a glorious week we have had weather wise for Spring Break! It has been simply Amazing…the weather and the time off! Everyday, hubby and I have done something out of the ordinary and special so it’s made for a great week! It all started last weekend when we went down to Naples for a couple of days. 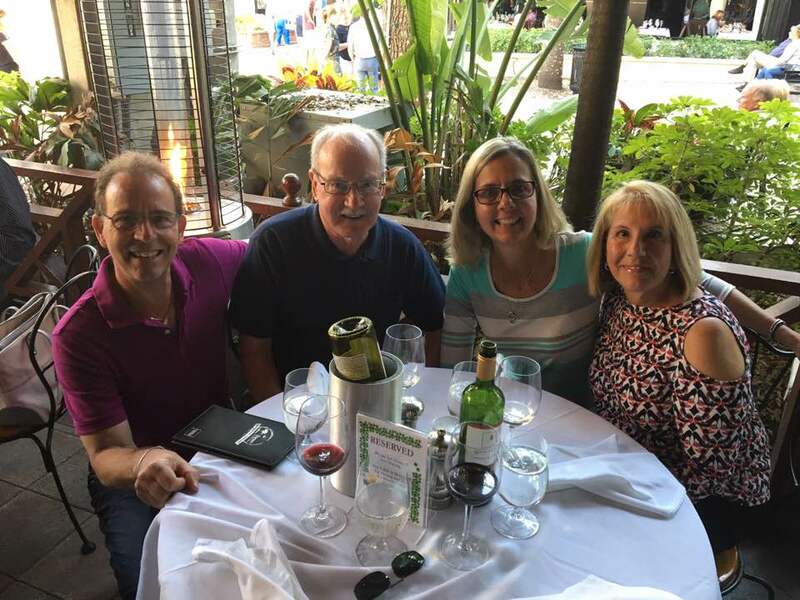 My good friend and fellow DT member at STB- Barbara Campbell and her hubby spend their winters here in Florida, and Barb (my Birthday sister) and I make it a yearly tradition to see one another. This year we ended are fabulous day of breakfast and craft shopping with a fantastic dinner, where we included our Hubbies too! We all hit it off so well and had a terrific time! Barb’s hubby Tom is as sweet as he can be, just like her! Can’t wait till next year when we get to do it again. Here is a pic of all of us together. Now a bit about my card! 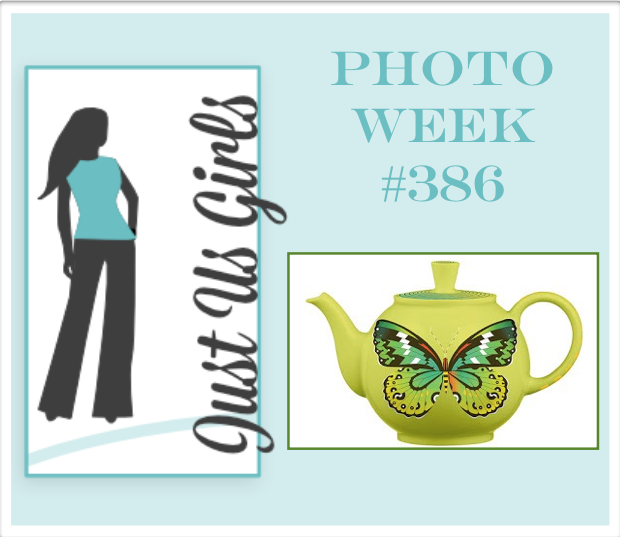 Over at Just Us Girls it’s Photo Week and that is where the inspiration for my card came to be. The stamps are all from Verve except for the script background. I found a piece of that butterfly paper and thought it worked out well. I fussy cut my tea pot, then tried to cut out a butterfly to put on the tea pot, but it just didn’t look right, so I went with a flower instead. 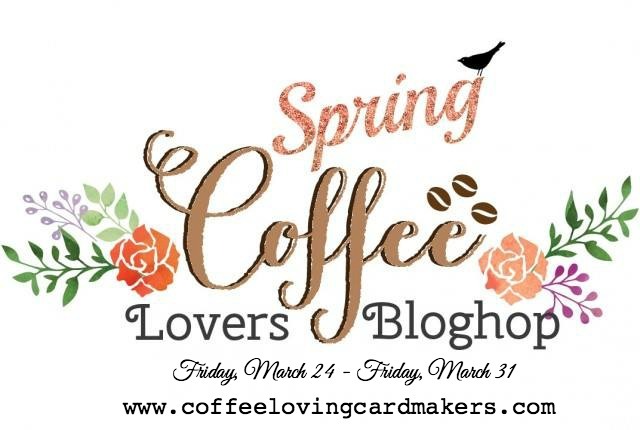 I am also going to be linking up my card over at the Spring Coffee Lovers Blog Hop! The have over 60 sponsors! Yes I said 60+! BTW you are allowed to link up TEA and Hot Cocoa cards too! You have to go and check it out! Categories: Cards | Tags: Card making, Cards, friendship, rubber stamps, stamping, Verve Stamps | Permalink. I love your tea themed card. So happy you had a great visit. Wowzer! Loving this card with the colorful background. Great to see that you picked up some of the colors in the background for your teapot. The sentiment seems to fit so well for the week that you had for your Spring Break. Starting with our great day of visiting and dinner with the men in our lives. Thanks for top billing. Love you birthday sister! I love your tea themed card. The teapot is adorable and I think the flower is perfect on it. Great photo of all of you. Glad you had a good visit and a great week of spring break. I hope you win something on that coffee hop! This card is beautiful. Such a pretty card, love the tea theme! What a darling tea pot, Nancy. I love all the paper you used to tie into the butterflies. I love this pretty beauty! All those pretty butterflies. Love that teapot! Gorgeous LO, love this pretty creation! This card is so gorgeous! I love all of the butterflies in the background and the script behind the teapot! Your card is so stinkin’ cute. I adore that little teapot. How sweet. I adore all your layers too! So much going on here, and it all works perfectly. Donna would LOVE it. She’s all about layers. That background paper is exactly right, and the little flower with the brad on the teapot just makes me smile. The other thing that makes me smile is that awesome photo of the 4 of you. It makes my heart happy!!! Oh, and I’m pinning!!!! Such a great card and picture. 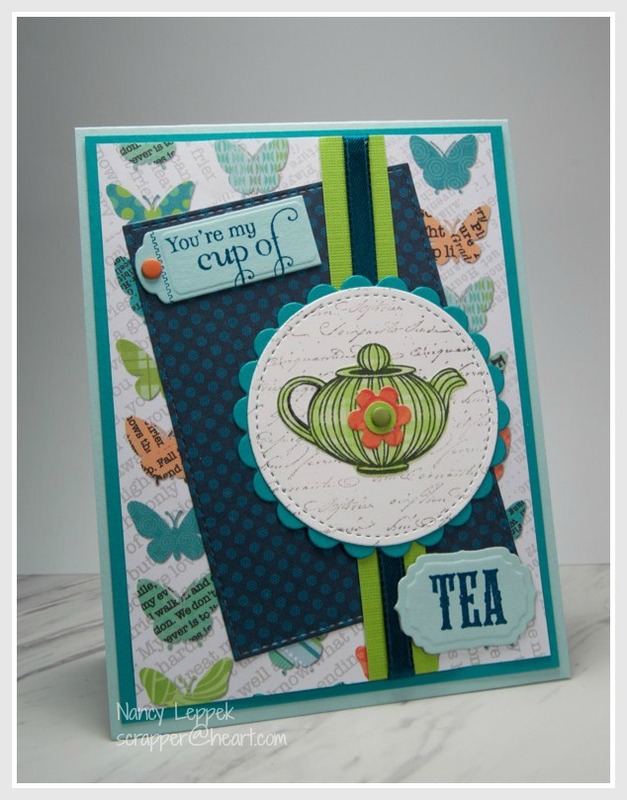 Your teapot is wonderful and love the butterfly background paper. Another stunner Nancy. Gorgeous DP and that teapot is adorable. Nancy, You chose some wonderful colors for this card. Love the tea pot in the center. Great card. Sylvia D.
This is fabulous! I love all of those butterflies on the background. And that little teapot is adorable with the flower on the script circle. Great design and details. Such a wonderful card, Nancy! I just love everything about it! That teapot is perfect with its flower. Thank you and the other ladies for having me as guest this month! I really enjoyed it alot! So very beautiful…that pot is so sweet and love the papers and colors!